ISLAMABAD, March 22: The Patron-in-Chief of the Supreme Shia Ulema Board and chief of the Tehreek Nafaz Fiqh-e-Jafariya Agha Syed Hamid Ali Shah Moosavi has said that Ibleesi powers are putting the international peace on stake by inciting religious hatred against the Muslim Ummah. An emergent session of the United Nations should be called to get rid of humanity of oppression, brutality and terrorism in the backdrop of gory incidents of terrorism in New Zealand followed by other countries. The fresh incidents of extremism and terrorism have once again proved that America and her ally western countries are promoting enmity with Islam. Indian prime minister Modi should remember the saying of Mahatma Gandhi that if Hindus are wiped out from the subcontinent then Hinduism will be wiped out for ever but if Muslims are wiped out from the subcontinent Islam and Muslims would remain alive in the world. The terror attack on Levies check post in Ziarat is the act of pet terrorists of our perpetual enemy and the government should tighten noose around proscribed groups so as to root out all riot elements including terrorism. The name of Hazrat Ali Ibne Abi Talib (A.S.) is the manifestation of faith and power. Whether it is 1965 war or Indian infiltration the slogans of Nara-e-Haideri warm the hearts of Pakistan’s Armed Forces and they are seen challenging the enemy forces. Muslims the world over can confront colonial powers and excel in knowledge and arts in every era through attaching themselves with the personality of Hazrat Ali Ibne Abi Talib (A.S.). He expressed these views while addressing the event of Jashan-e-Murtazvi marking the Youm-e-Wiladat Purnoor of Maulood-e-Haram Amirul Momineen Sher-e-Khuda Hazrat Ali (A.S.). He also announced to observe 15 Rajab-ul-Murajjab as Youm Sharikatul Hussain (S.A.) in connection with the Shahadat of Mujahida-e-Karbala Hazrat Syeda Zainab Binte Ali (S.A.). Agha Moosavi said that no human being can adjudge the expansion and heights of the Ali Al-Murtaza’s place. He said his personality imbibed with perfections on which are showered the blessings of Allah and Rasool (SAAW) immensely. He said Ali (A.S.) is the symbol of devotion with Risalat, bravery, knowledge, faith, truthfulness, justice and judgment. He said Ali (A.S.) is the path leading to Nabi (SAAW), is the mirage of Allah’s Abdith, is the person who resolves the problems of the oppressed, is the shelter for the have-nots, and the centre of unity for the Muslim Ummah. He made it clear that Haider-e-Karrar (A.S.) is the Allah’s Wali, source of Wilayat that feeds the Aulia Karam in every nook and corner of the country and disseminated Nabi Kareem’s Message of Risalat. The TNFJ chief said that according to Hazrat Shah Wali Allah, “Hazrat Ali (A.S.) is the one who opened the door of Wilayat in this Ummat-e-Marhooma. There is none from Aulia-e-Ummah who is not linked with the family of Imamat of Hazrat Ali (A.S.).” Every Wali from Hazrat Shahbaz Qalandar and Khawaja Ghareeb Nawaz to Maulana Room and Shams Tabraiz is seen raising the slogans of “Ali, Ali”. He said Allah’s first Home on earth has been declared the place to bow at for the whole humanity and is the guidance source for the whole world and there are many symbols in it; one who enters it, finds peace. He said the great personality of Hazrat Ali (A.S.) was born at this holiest place on 13 Rajab-ul-Murajjab, 30 Aam Al-Feel who later wiped out the centre of humanity i.e. Ka’aba from idols by riding the shoulders of the most supreme personality of the universe Hazrat Muhammad Mustafa (SAAW) and disseminated the enlightenment of Allah’s Oneness and Nabuwwat of Khatam-ul-Mursaleen (SAAW). He said prior to Hazrat Ali (A.S.) Khana Ka’aba did not serve as a birthplace for anyone; Allah bestowed this supremacy only for him so as to shower His glory, greatness and authority on the people. Agha Moosavi said he was named ‘Asad’ by Hazrat Abu Talib (A.S.), named ‘Haider’ by his mother Hazrat Fatima Binte Asad (A.S.) and was named ‘Ali’ by the Sarwar-e-Kainaat (SAAW). One day his mother was away for some work and a snake stepped up his cradle. Hazrat Ali (A.S.) grabbed his mouth by extending his hand and ripped his mouth through. The mother on her return saw this and instantly said my son is ‘Haider’. He said that there is a saying of Hazrat Ali that “Rasool-e-Khuda (SAAW) used to chip him with his chest, used to sleep him beside him, used to give his frangrance to him, and used to chew anything first and then giving its loaf in my mouth. I used to follow Nabi Kareem (SAAW) in a manner like a baby camel follows his mother.” (Nehjul Balagha). 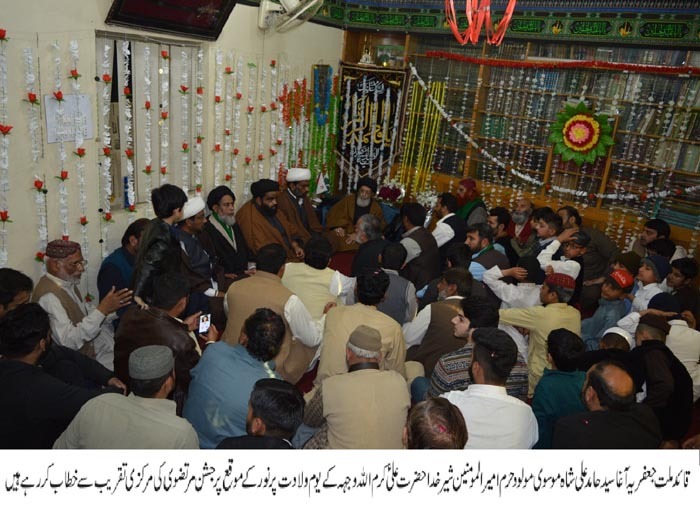 The Quaid-i-Millat Jafariya Agha Syed Hamid Ali Shah Moosavi paid ‘Hadia-e-Tabreek’ to the Khanwada of Khatmi Martabat (SAAW) on the occasion of Jashan-e-Murtazvi and reiterated his resolve to continue his practical struggle for restoration of justice and fair-play, condemning oppression, suppression and brutality and supporting the oppressed till the flag of justice and fair-play flutters all around the world.